Doing some research on mattresses before you make a selection is great way to make sure you are getting one that will meet your needs. Take your time, ask questions and remember to lie down for at least 20 minutes when testing a mattress in the store. Put your best foot forward when it comes to your sleep. it’s worth it! Q: For young people without any specific medical issues (back problems, sleep apnea, etc), but are looking for a reasonably priced, comfortable mattress, what should we look for and what price range should we expect? A: Thanks for asking, great question. Purchasing a mattress is a tactile event. I recommend getting out with your parents or on your own to go and lay on some that you feel are in your price range and when pressed down with the palm of your hand are the comfort or feel you are looking for. Spend as much time as you can stand lying on the mattress, at least 5-10 minutes or more. It depends on the size price range wise, but expect to spend $500-1000 on a new mattress. If that is outside of your price range, you can certainly look at Sam’s Club or other second hand stores. I do not advocate that option, but you can certainly look there and may find one that fits your budget and your needs. Thanks again! Q: Is there a type of bed that’s best for people who sleep exclusively on their side? A: I would advise something softer that will cradle and nestle you around your hip and shoulder. Something too firm will cause pressure on your shoulder and your hip which can cause tossing and turning. Thanks for asking! Q: Hi and thanks for answering questions, can I get your opinion on Sleep Number beds? A: I am not a large supporter of Sleep Number beds. The reason why I don’t believe in them is that they don’t use surgical PVC or plastics inside of their beds, which makes their beds particularly susceptible to mold. Although this photo is hosted by a company pushing their own air bed (which I have no knowledge of and am not cosigning), this photo is indicative of the problem Sleep Number beds frequently have happen, click here! Thanks for asking! Sleep 7-9 hours on your dream bed and you can’t go wrong! Make sure you lie down on a bed for at least 10 minutes before making your purchase. 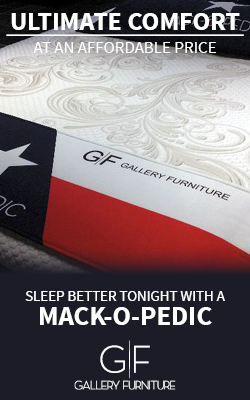 Come on in to one of our 2 locations in Gallery Furniture and we will be thrilled to help you find the perfect match! Start Making Sleep Important Tonight!